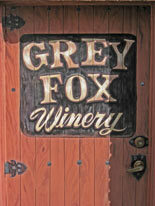 It is a quirk of the region that the Grey Fox Vineyards are partially in the Sierra Foothills area and the Central Valley region of California. 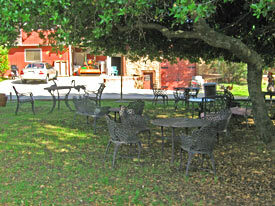 The winery building is built into the side of the hill with whimsically painted doors. The walls of the tasting room are covered with great historical articles regarding the local wine growing region. The grounds are incredibly beautiful, from the romantic wrought iron gates and oak studded picnic area to its incredible views of the Sutter Buttes and Table Mountain. Located on eleven acres at around the 700 foot elevation, the estate vineyards are planted to eight French and Italian varietals. The winery utilizes a vine moisture sensing system which facilitates ‘just-in-time’ watering processes. This keeps the vines from being over watered and ensures a concentration of flavor and color in the wine. 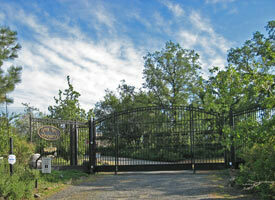 The estate purchases Chardonnay, Merlot, and Cabernet Sauvignon from cooler California wine regions. All initial aging in done in stainless steel to reduce the risk of bacterial infection. After racking, the wines are aged in a combination of American and European oak. The wines of Grey Fox have surprisingly good acidity for an area that can produce such high temperatures. This can be attributed to the temperature shift from day to night brought about by the cooling breezes off the Sierra Nevada Mountains.